Edited by Maia Wellington Gahtan, Istituto Lorenzo de’ Medici and Donatella Pegazzano,Università degli Studi di Firenze. 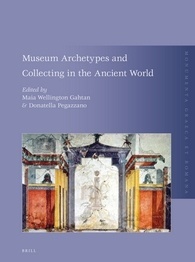 Museum Archetypes and Collecting in the Ancient World offers a broad, yet detailed analysis of the phenomenon of collecting in the ancient world through a museological lens. In the last two decades this has provided a basis for exciting interdisciplinary explorations by archaeologists, art historians, and historians of the history of collecting. This compendium of essays by different specialists is the first general overview of the reasons why ancient civilizations from Archaic Greece to the Late Classical/Early Christian period amassed objects and displayed them together in public, private and imaginary contexts. It addresses the ranges of significance these proto-museological conditions gave to the objects both in sacred and secular settings.